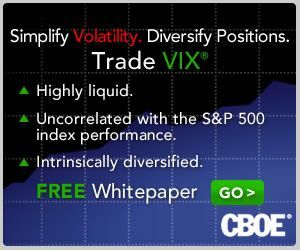 VIX and More: Can Selling Options Make You a Better Trader? Can Selling Options Make You a Better Trader? I used to have a list of trading rules guidelines taped to my monitor. The list went through several iterations, but near the top were always reminders that a good trader needs “patience and discipline” to be successful. The list is no longer there, but by now the important ideas have been branded into my psyche. On a related note, over the course of the past few years I have increasingly gravitated toward trading options. More often than not I find myself selling options, either with or without a directional bias, and enjoying time decay (theta) work in my favor to increase my portfolio value. Recently, it occurred to me that selling options has made me a better trader because it has cut down on the number of trades I make and enhanced my patience and discipline. How does this happen? Each morning I look at my portfolio and see what my portfolio’s aggregate theta is. This tells me how much money I will make from time decay alone if the market does nothing and I do not make any trades. As a rule, I try to structure my portfolio so that the aggregate theta is at least as large as my daily profit target. For this reason, I never rarely feel obligated to “make something happen” and force trades that should not be taken. While there are many approaches to trading, I believe that every trader should be comfortable trading long positions and short positions, buying options and selling options. Better yet, traders should not have a built in bias toward long-only trading or only buying calls. Ideally, a trader should be directionally agnostic and equally comfortable with the full menu of possible trades. Ultimately, a considerable amount of trading success comes down to the “know thyself” dictum. A trader that understands his or her personality type, comfort zones and preferences can do a better job of applying the appropriate psychological approach to trading. These skills are some of the most difficult for many traders to master. It is quite possible that selling options may provide a shortcut to developing some of those skills. For more on applying psychology to improve your trading, the best resource on the web is undoubtedly Brett Steenbarger’s TraderFeed. For more on theta and time decay, check out Theta, an excellent overview of the subject at Know Your Options, a promising new options blog authored by Tyler Craig. I agree. In addition to descipline and a good trading system, you have to have a good understanding of money management concept. Enjoy your blog. Keep up the good work. Feel free to visit my blog at your convenience. I have a small trading account and only buy calls and puts at this time. Am I correct that selling calls and puts require a larger account, including a margin account, due to the higher risk? Yes, selling options requires more trading capital and should also probably be done in a margin account to make the best use of available capital. On the other hand, you can use spreads to limit risk -- as well as capital needs. Something to look into anyway. Selling options had made me a much better trader. It has taught me what not to do. Risk/reward makes no sense! Buying calls or puts is a sure looser bet. Selling them makes more sense; and spread are the best way to express bullish or bearish bet. Sell calls or puts, as long as you know risk management and value at risk (VaR). Understand of greeks may help in risk management and understanding VaR. I could have written today's commentary for you. My approach is the same, I mean the same!!! There are times I go 2 days without making an adjustment. Once I embraced this, my profitability became consistent. Thanks for your work. Selling credit spreads limits one's risk and avoids the unlimited risk of selling naked uncovered options. A respected financial newspaper article outlined the negative financial results that David Caplin encountered by selling naked put options before a major stock market decline. He is not the first large trader to encounter this scenario. Selling credit spread risks can make one a better trader, especially when the volatility of the indexes or stock options are high and/or when indexes and/or stock options are trading near support areas. Vertical spreads are an excellent way to reduce risk. Great post Bill - Thanks for the shout out. Would you willing to share your trading rules / guidelines? I, for one, am always curious to see what these care. By and large, they tend to be fairly consistent across good (to excellent) traders. I'm curious, nonetheless. i have tried both buy and sell options. after all these years, i have finally settled down onto selling put options which i find is an excellent strategy and yet conservative for a consistent monthly income for me. Cash on the Sidelines Headed Back to Stocks? Chart of the Week: Bottom in Housing Starts? Can the Banks Rally for More than a Week? More Volatility + Less Fear = Lower VIX?